Mechanical dredging of sediment from within the bulkhead area and placement of 18 inch cap with an armoring layer in the area. Placement of a 6 inch cap and a 12 inch cap over 37 acre area. Cap consisted of a sand, filter stone, and an armor stone. 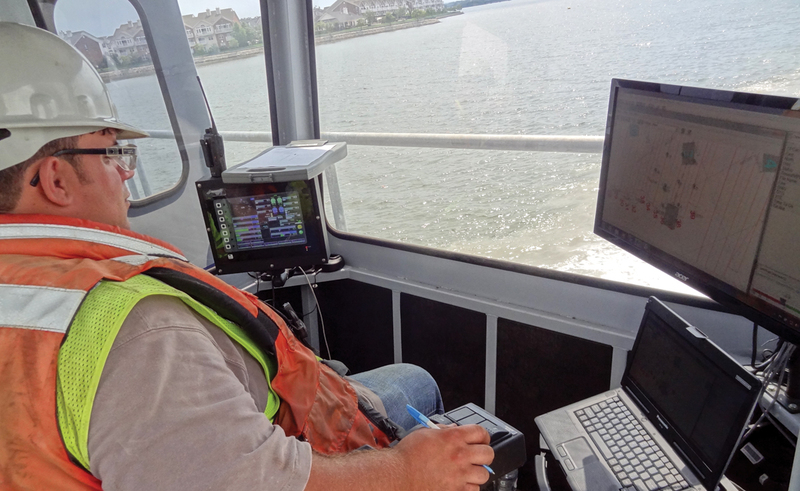 Waterway traffic control coordination required during implementation of in-water operations. Utilization of two hydraulic slurry sand capping placement systems designed and patented by Sevenson. Hurricane Sandy disrupted operations for 3 weeks. This posed special challenges to the project team. Capping using 5 different material types totaling over 120,000 tons. Study Area 7 is location in Jersey City, New Jersey. The site was used for commercial and industrial activities for much of the past 100 years. Historically, the area was contaminated by hexavalent chromium from Chromium Ore Processing Residue (COPR), which was stored and utilized as fill material. 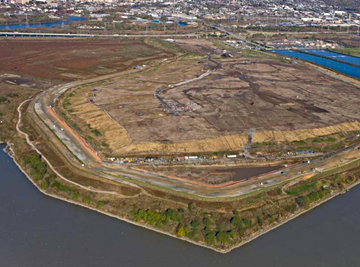 Remedial action was implemented in compliance with an Administrative Consent Order (ACO) entered into by the PRP and the New Jersey Department of Environmental Protection (NJDP). Sevenson was awarded this contract on a competitive proposal basis. 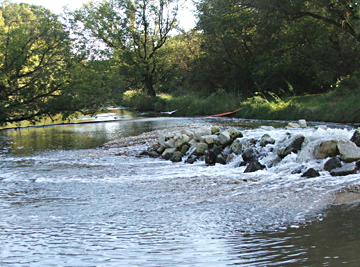 The proposal included Sevenson’s proposed methodology for dredging and sediment capping. 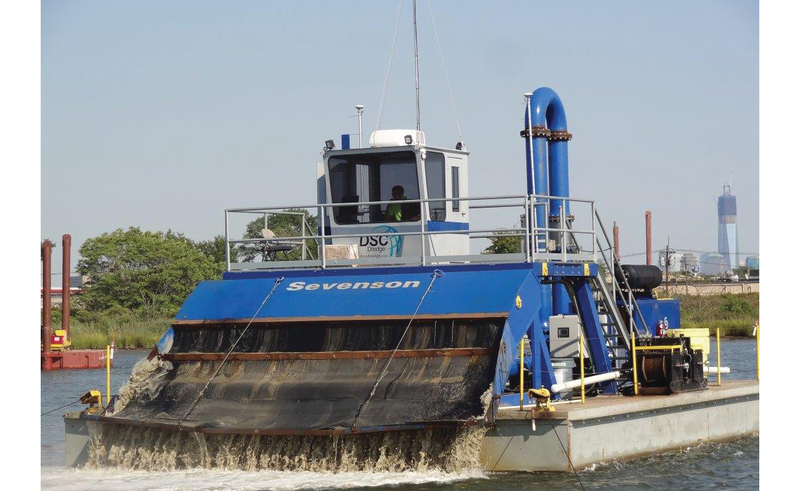 Upon award Sevenson participated in the final design process as well as conducted field demonstration to prove its selected approach would meet performance requirements. 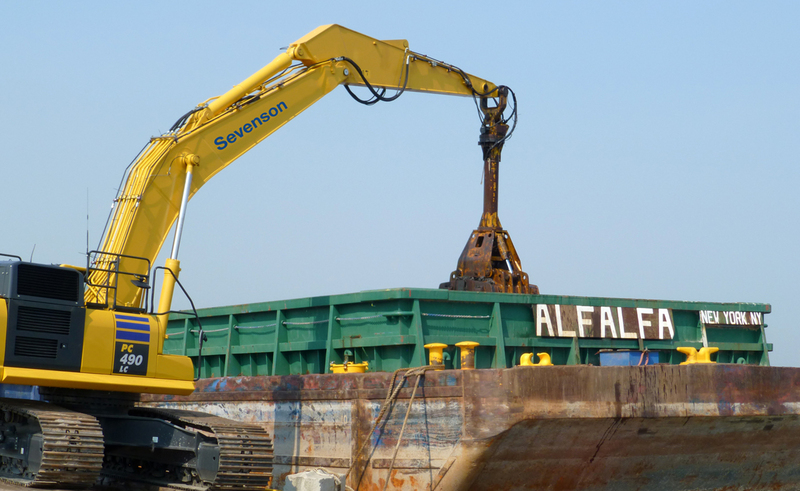 Mechanical dredging was conducted in an acre area adjacent to the SA7 bulkhead to a minimum of 24 inches below existing surface. 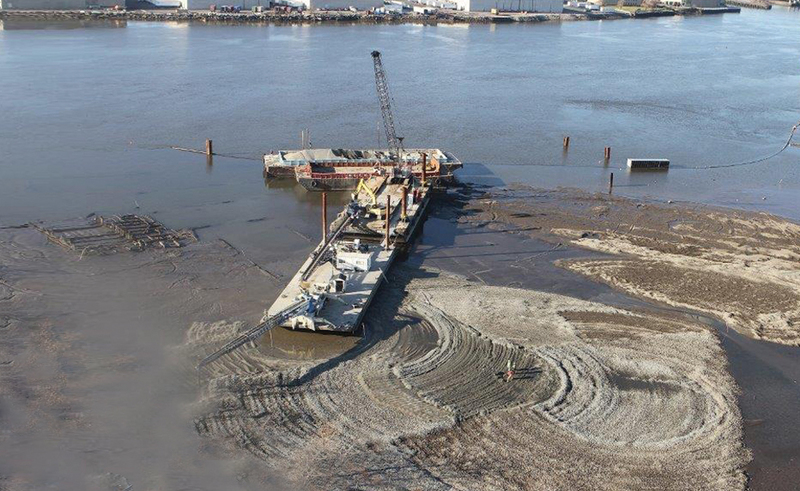 Sediment was loaded into 1,000 CY scows and barged to processing facility. At the facility dredged spoils were stockpiled for gravity dewatering then fed into pugmill system for blending with Portland cement. 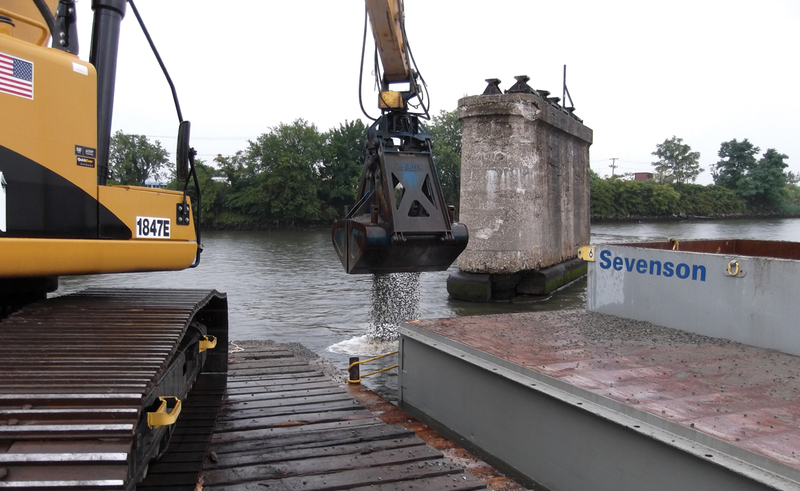 All interstitial water generated from the dredging operation was allowed to decant for 24 hours then pumped back overboard into the Hackensack River per the permit requirements. An 18 inch cap was installed in dredged area. The cap consisted of an armoring layer to prevent future cap erosion. 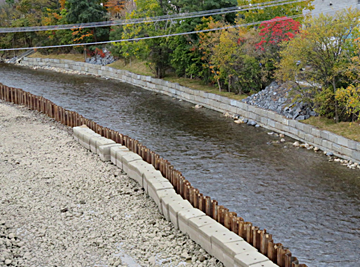 The balance of the project required Sevenson to install a cap in a 37.5 acre area. Sevenson’s approach for placement of sand materials and stone materials smaller than 1.5 inches (D100) in diameter involved a hydraulic slurry system. Armor (rock/gravel) materials larger than approximately 1.5 inches in diameter were placed using a hydraulic excavator with real-time kinematic (RTK) global positioning system (GPS). 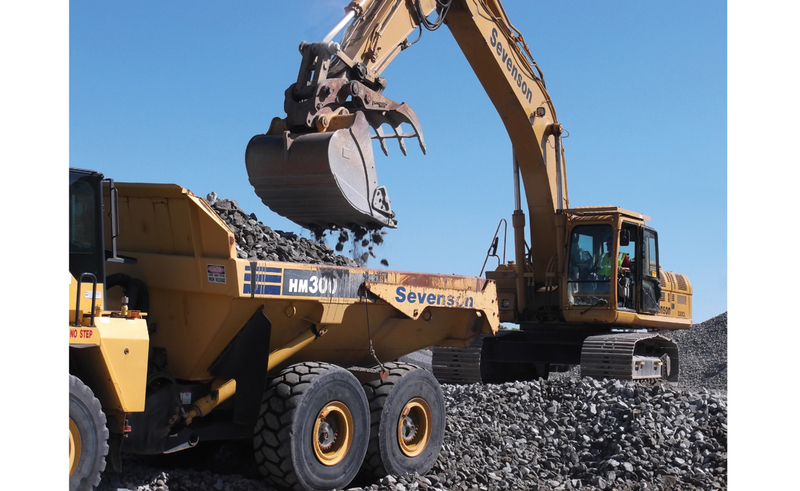 Sevenson designed, constructed, and utilized a custom-built slurry system for hydraulic placement of the sand cap and stone armor less than 1.5 inches in diameter to cap designated areas. The system consists of a feed hopper, and a slurry system that will pump the sand and small stone hydraulically through a pipeline for placement through a diffuser system mounted on a barge. The pump used to convey the sand slurry is a booster type pump commonly found on dredging projects. The hopper and slurry system will be placed on the upland portion of the SA7 property to minimize pumping distances and the need for booster pumps floating on the water. For spots that could not be reached with the spreader barge or for materials larger than 1.5 inches, a long reach excavator placed sand and armoring. The long reach excavator was pulled as close to the shoreline as possible without resting on the river bottom. Small scows (e.g., 12 ft x 30 ft with 2 ft draft) were loaded with cap material (sand and various sized rock materials) and brought to the stern of the flexi-float barge holding the excavator. 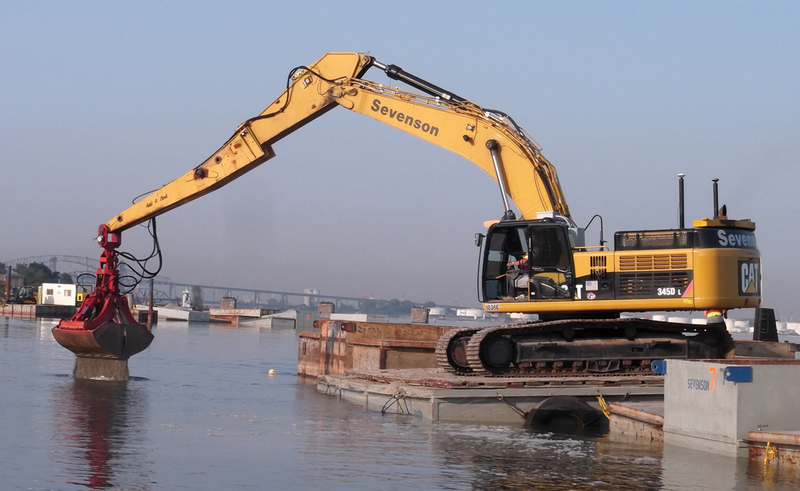 The excavator placed the materials along the shoreline. 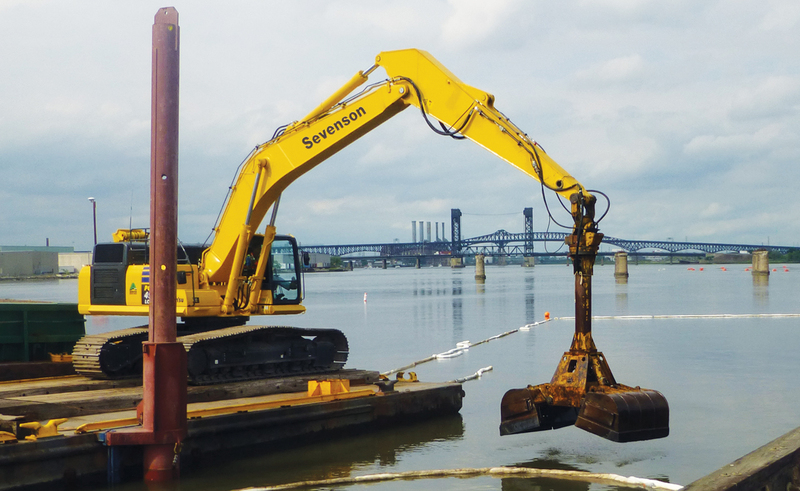 Sevenson used RTK DGPS system for positioning of the barge system and the excavator bucket for mechanical placement. The software for the hydraulic capping system was the Dredgepack system designed for a hydraulic dredge. The hydraulic dredge software is modified for placement of material rather than removal of material (i.e., for the hydraulic spreader barge). The software shows programmed track lines (lanes) to follow and changes the color of the screen following a layer placement. The start and end points for each line were programed into the software. During cap placement, monitoring of the initial sand lift, and subsequent lifts, was conducted through the use of collection pans and/or sediment cores, and material quantity and quality monitoring. This monitoring was used by Sevenson to adjust the feed system and placement process as work progresses. Sevenson performed lift thickness verification using collection plans, coring, and settling plates.